The USSR blamed anti-communist demonstrations in America for their non-participation at the 1984 Games in Los Angeles, claiming the safety of Soviet athletes could not be guaranteed. East Germany, Cuba, Poland, Bulgaria, Czechoslovakia and Ethiopia were among 17 boycotting nations that between them had taken 58% the gold medals in Montreal. Nevertheless, a record 140 nations participated, the Games made a profit of $223million and Carl Lewis matched the achievement of fellow American Jesse Owens at the Berlin Games of 1936. Lewis won four golds - the 100metres (9.99 seconds), 200m (19.80secs), 4x100m relay (37.83) and long jump (8.54m). British decathlete Daley Thompson retained his Olympic crown and Ed Moses, a victim of the American boycott of 1980, regained the 400m hurdles title he had won in Montreal. American Joan Benoit won the first women's Olympic marathon. The men's 100m final is considered the blue riband event of any Games and the race not only defined the Seoul Olympics of 1988, it also tarnished them. Canadian Ben Johnson won in a world record 9.79secs but then tested positive for the anabolic steroid Stanozolol and was stripped of the title and time. Silver medallist Lewis was promoted to gold. American sprinter Florence Griffith-Joyner won three golds - the 100m (10.54), 200m in a world record 21.34 and 4x100m (41.98) - and although her bulked-up physique and deeper voice fuelled speculation of steroid abuse, Griffith-Joyner never failed a drugs test. She died in her sleep aged 38 after a form of epileptic seizure. In the pool, East German Kristin Otto won six golds - 50m freestyle (25.49secs), 100m freestyle (54.93), 100m backstroke (1:00.89), 100m butterfly (59.00), 4x100m freestyle relay (3:40.63) and 4x100m medley relay (4:03.74) - while American Matt Biondi won seven medals, five of them gold. Germany's Steffi Graf, who had won all four Grand Slam tennis tournaments in 1988, added gold at the Olympics as tennis returned to the Games after a 64-year absence. A record 169 nations participated in the Barcelona Games of 1992, and professional athletes were admitted for the first time. It allowed the USA dream team led by Earvin 'Magic' Johnson to light up the Games on the way to Olympic glory. On the track, Jamaican-born Brit Linford Christie became the oldest 100m champion at the age of 32, and Hassiba Boulmerka gave Algeria its first Olympic title in the women's 1500m. In the pool, Hungarian Krisztina Egerszegi won three individual golds, in the 100m backstroke (1:00.68), 200m backstroke (2:07.06) and 400m medley (4:36.54). Belarusian gymnast Vitaly Scherbo won an incredible six gold medals - all round, parallel bar, long horse vault, rings, pommeled horse and team combined exercises - and American boxer Oscar De La Hoya became lightweight champion at the age of 19. Two black athletes stole the show at the 1996 Games in Atlanta, the birthplace of Martin Luther King. American Michael Johnson won the 400m in 43.49secs and three days later added the 200m title in a world record 19.32. France's Marie-José Pérec completed the same double and in the process became the first athlete, male or female, to retain an Olympic title at 400m. 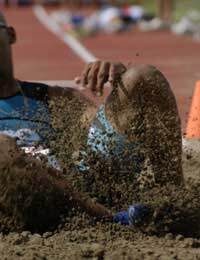 Lewis won the long jump title for a fourth consecutive Games, giving him a ninth Olympic gold medal at the age of 35, while, in the pool, Russian Aleksandr Popov retained the 50m and 100m freestyle titles he had won in Barcelona, becoming the first man to retain the 100m title since Johnny Weissmuller in 1928. A record 79 of the 197 participating nations won medals and Austrian yachtsman Hubert Raudaschl became the first athlete to compete in nine Olympics. The new millennium began with a record-breaking Games in Sydney, featuring 199 nations, 300 events, 10,651 athletes and the biggest Olympic stadium yet, the purpose-built, 110,000-seater Stadium Australia. The Atlanta Games had suffered from poor organisation, but there were no complaints in Sydney as legendary British rower Steve Redgrave won his fifth gold medal in five Games, winning the coxless fours with James Cracknell, Tim Foster and Matthew Pinsent. Cathy Freeman was the home-grown hero, winning the women's 400m for Australia and the Aboriginal community, while Ethiopia's Haile Gebrselassie retained his 10,000m crown. In the pool, Australian Ian Thorpe won two titles in the space of an hour, both in world record times - 400m freestyle (3:40.59) and 4x100m freestyle relay (3:13.67). He later added a 4x200m freestyle relay gold. Holland's Pieter Van den Hoogenband won the 100m and 200m freestyle double. American sprinter Marion Jones won three gold and two bronze medals, but she later admitted taking performance-enhancing drugs and was stripped of her medals. What was the name of the Black British chap who totally dominated his field(post-Thatcher Prime Ministry,I think)?As a Yank,I naturally wanted an American to win,but felt only a little less joy when a Brit ally won(rue a USSR medallist! ).Thought that with his persona,size, and handsomeness, he could have portrayed James Bond excellently.